Delicious sushi can be a treat for all. Sushi delivery is the best way to make sure that you are getting a filling and thrilling treat. What’s more, the best thing about sushi is that everyone can enjoy it. Vegetarians can still have their fix of wholesome sushi too. Veggies throughout the length and breadth of London know this scenario all too well: it’s Friday night and you’re having a night in with your friends. The wine is flowing and someone suggests a takeaway. There’s a pause. Suddenly, everyone remembers that you’re a vegetarian. Quiet descends on the room. What can you feed the person that doesn’t eat meat? Pizza takeaway is great for most people. But, vegetarians often wonder whether they are going to get an errant piece of chicken or pepperoni in their margarita. Let’s be honest, it’s happened to all of us. Suddenly, your cheese and tomato pizza is not as vegetarian friendly as you would have hoped. Chicken franchises and burger franchises strictly cater for the meat-eaters of the Capital. It seems like the rest of London has forgotten about our vegetarian and vegan friends. After all, everyone needs to eat and let’s be honest; no one wants to cook all of the time. Sushi delivery in London provides the perfect option for all. Often, the vegetarian community in the UK feels a little left out of takeaway ordering. The feeling of isolation and alienation is not one that is enjoyed. Here’s where our handmade sushi comes in- straight from the kitchens of London, our sushi is the perfect takeaway choice for all. The feelings of alienation are certainly gone when you take one bite into a delicious handmade sushi box that has been lovingly prepared and delivered to the comfort of your own home. One of the best things about our beloved handmade sushi from London is that regardless of whether you are a carnivore or a strict vegetarian, the age old debate of what to have for a Friday night takeaway is suddenly over. Handmade sushi in London just became the way to end debates with your pals on a Friday night for good. For vegans, this dilemma is heightened even more. But, did you know that sushi is the perfect choice for both vegans and vegetarians alike? 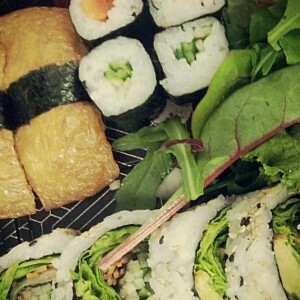 You can have your home delivery of sushi and be safe in the knowledge that it is vegan-friendly and a healthy choice too. Not everyone wants to eat a takeaway that is laden with cholesterol and fats. Healthy, vegan and vegetarian food doesn’t mean munching on carrot sticks. Sushi delivery is the best way to indulge, and you don’t have to feel guilty about the calorie count. Sushi is healthy food that hits the spot. The ingredients in a handmade vegetarian sushi roll are simply divine. Indulgent avocado, delicate rice, delicious seaweed and crunchy, seasonal vegetables make for the perfect takeaway. One of the best things about this is that you don’t even have to leave the house when you have healthy sushi delivery in London right on your doorstep. There are some perks to living in the Capital after all!